When approaching this little-visited mountain range east of Yuma, Arizona, ones first impression might well be that it is a place of extreme desolation, barren of life, and lacking beauty. Yet when the Arizona Naturalists conducted a field trip on the last weekend of January 2010 flowering shrubs, birds, butterflies and mammals were all about. After dusk a great number of moths were on the wing visiting flowers and laying eggs on their host plants. True, visiting during the hottest summer months (May through September) is probably ill-advised. 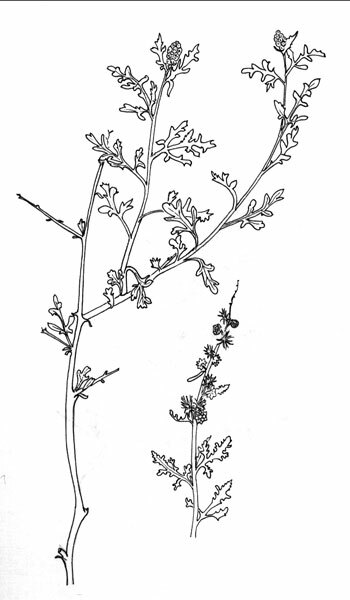 Most flowers and the thickest vegetation was found along the washes and canyons that slice through the range. These canyons offer the easiest routes through the very rugged terraine with sheer verticle cliffs of mostly easily erodable volcanic rhyolite and tuff. View the area on Google Maps. 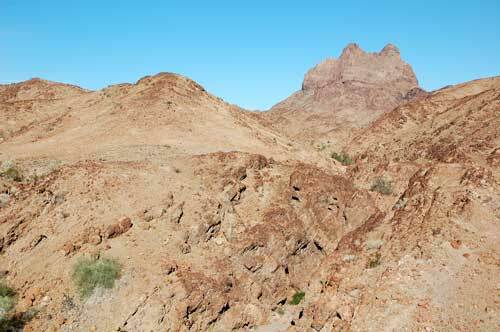 This view of the Muggins Mountains is from the west near the trail head at Couty 7th Street. Access is available from Exit #21 off I-8 at Ligurta. Follow Dome Valley Rd. to County 7th Street and turn east (right). After the closed transfer station the road is narrow and may require a high clearance vehicle. 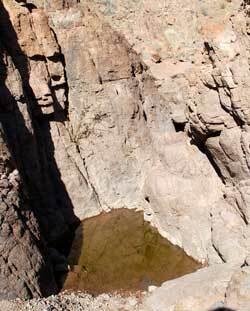 Detailed directions available at the US BLM: more info. 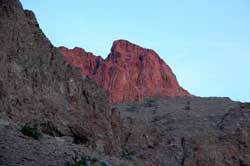 The Muggins Mountains Wilderness is managed by the U.S. Bureau of Land Management (BLM). During rare, violent thunderstorms rushing water can gouge out a basin from solid rock that will later hold water for weeks or months. The locations of these shaded tanks, called tinajas in Spanish, is vital knowledge for desert peoples. 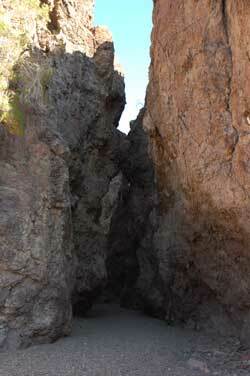 This deep, narrow, canyon has been carved by water through relatively soft rhyolite and tuff in the Muggins Mountains Wilderness. 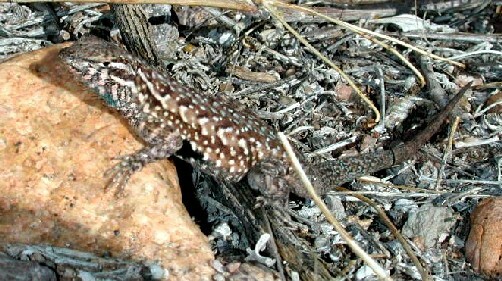 When temperatures are cool side-blotched lizards will emerge and bask in the sunshine. Notice the dark splotch on the flank immediately behing the first pair of legs. Saguaro Cactus -- Carnegiea gigantea - very rare! White Bursage has whitish stems and leaves. A Sharp taragon-like aroma issues from crushed foliage. Flitting along wash banks suggesting that milkweed vine was present even though I failed to find it. Taking nectar at the Pygmy-Cedar flowers. This butterfly is here in part because it's favored host, Rock Hibiscus, is here.